WHY CHOOSE ABC Taxi & Airport Transportation for your taxi and airport transportation needs? 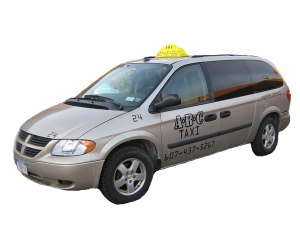 ABC Taxi & Airport Transportation is independently owned and operated. Since an owner will be your driver almost every time, you can be assured of having a safe, reputable, experienced, clean-cut, drug-free driver. Drivers are non-smokers, so vehicles always smell fresh. Competitive pricing that is usually the most affordable in the area. Vehicles meticulously maintained and mechanically sound at all times. Vehicles thoroughly cleaned each day. 14 years of transportation experience. We will set up your airport drop-off or pickup with you so that it is an easy, enjoyable experience. Fully insured with a local Oneonta taxi medallion license and New York state Class E livery license. CALL AROUND! IF YOU FIND A RIDE THAT IS A FEW DOLLARS CHEAPER, ASK IF THEY GUARANTEE THE ABOVE!! *FREQUENT RIDER DISCOUNT CARDS AVAILABLE! GET $5.00 OFF EVERY SEVENTH RIDE!! *All major credit cards and debit cards accepted!